In our real life we do come across many practical problems where we have to think out of box. Sometimes in these practical problems we have to thinking mathematical to reach the solution or the problem. Sometimes we have to play detective to solve the mystery. Sometimes these problems related to our knowledge to science or other subjects and sometime you got a imaginary situation given by your friends and your have to find the solution of the these situations. Here we are putting six such practical problems which you may come across in your daily life. Some of these problems may look difficult to solve and few of these problems may look impossible to solve. To give your best to solve these problem and try to come up your answer for each of these practical problems. These problems has some remarkable solutions which are published at the end. So are you ready to solve these mind blogging practical problems? Lest start with easy mathematical practical problem which a father come across during the visit of his son. I) Once a son is visiting his rich father. His father wanted to gift him gold. However he don't want to fix the amount of gold to be given to his son. So he decides that he will gift his son as many grams of gold as the date of arrival of his son. It means if his son visit him on 1st day of the month, then he will be gifted 1gm of gold. Similarly in case his son visits him on 28th day of the month, he will be gifted 28gms of gold. He is having a gold chain which is 31 gms in weight and has 31 parts joined as a long chain. He wanted to keep the gift ready and so wanted to cut the chain in 31 parts. However his wise wife suggested that he don't need to cut the chain in 31 parts and still he can manage to get the number as required with very few cuts. Now question is what are the minimum cuts required to break this chain into so that his desire of giving the number of gold coins is full-filled? Were you able to solve this Gold Chain practical problem? If not, give one more try. If yes? Great and try out some Easy Mathematical Puzzles. You can now move to the next problem in which you have to play detective and solve the murder mystery. II) Detective Serlock Homles reviewed the information they had on the case so far. A lady was found shot and they already had a list of suspects - Tom, Harry, Harsh, Aaron, and Robinson. Plus, there were five notes that were found that were from the killer. The first was found at the harbor. The second was found in an art studio. The third was in a restroom. The fifth in a house. All of the notes read the same thing, "The clues are where you find the notes." Yet, nothing was found at anyplace the notes were. Taking one more look at all the clues, Detective Serlock immediately solved the case. Were you able to solve solve this Murder Mystery. If yes, do try some similar Murder Mystery Brain Teasers in which you have to play detective and solve the mysterious cases. Lets move to our next practical problem. This problem is very hard to get in today's life in which we have many devices like radio, smart phones, television etc. However assume this to be imaginary problem then try to find the solution of this brain teaser. III) An absentminded philosopher forgot to wind up the only clock in his house. He had no radio, television, telephone, internet, or any other means of ascertaining the time. He therefore decided to travel by foot to his friend's house, a few miles down a straight desert road. He stayed there for the night and when he came back home the following morning, he was able to set his clock to the correct time. Assuming the philosopher always walks at the same speed, how did he know the exact time upon his return? Note: this is not a trick question. The Philosopher did not bring anything to his friend's house, nor did he bring anything back with him on his trip home. By the time you have solved this problem, you are not expert in solving mathematical and logical practical problems. There are lots of Mathematical Brain Teasers and Logical Brain Teasers on this website. Do try to solve this puzzles to have fun and for sharpening your brain. Now its time to move to next practical problem which you may come across during your high school projects. Its related to Physics. In case you are not very familiar with this subject, you can skip this puzzle and then move the next one. IV) You are in a room with no metal objects except for two iron rods. Only one of them is a magnet. How can you identify which one is a magnet? If you are high school student then this problem may look very easy to you and you may come up with many different solutions of such problems. Do post your solutions in the comments section. Do checkout Brain Teasers for Students for solving many such puzzles and riddles. Now it time to move to next practical problem in which you and your family has to cross the river. Lets see if you can successfully cross the river with your family. V) Parents with two children - a son and a daughter - came to a wide river. There was no bridge there. The only way to get to the other side was to ask a fisherman if he could lend them his boat. However, the boat could carry only one adult or two children. How does the family get to the other side and return the boat to the fisherman? Were you able to cross the river along with your family. There are other River Crossing Brain Teasers which you should try to solve for fun and to give challenge to your brain :). Now its time for last practical problem in which you have to save your life from the forest fire. Lets see if you can escape from the island covered in forest. This Island Brain Teaser was not very much tough if you think out of box. If you solved it you should try out more out of box thinking brain teasers to twist your mind. 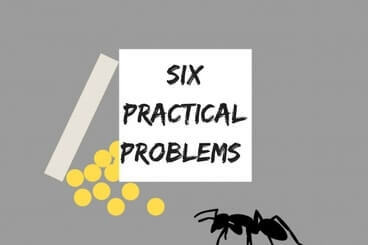 How many of these practical problems were you able to solve? If there is any problem which you have to solved yet, try to give a try again and come up with your solution to this problem. At the end your can compare your solutions with our answer. If you think that you have come up with better solution, do post your comments. Also do post your comments let us know which problem you were able to solve without looking at the answers? I) This problem can be solved by binary mathematics. He can divide the chain into binary numbers e.g. 1, 2, 4, 8 and 16 which can be achieved with four cuts only. Any number can be formed from 1 to 31 with the combinations of these numbers e.g. 28 can be formed with 15+8+4+1 and 17 can be formed with 16+1 and so on. II)The notes read "The clues are where you find the notes". It gives the clues about the places. Take the first letter of each of the place to find the name of the murder. It is Harsh. III) This is simple, he knows the time at which he left his house. Then when he reached his friend's house, he notes down the time to reach his friends home. As he always walks at the same speed, he will take the same time for returning his home from his friend's house. So he notes down the time at his friend's house before leaving his friend's house. After reaching his house he adds his time of travel to his noted time and then the fixes his clock. IV) You can try to bring one end of the rod (say A) towards the middle of the another rod (say B). If they stick then rod B is Magnet and rod A is iron. In case they don't stick then rod A is magnet and rod B is iron rod. 1. Both children go to the other end. 3. One of the parents go to the other end. 4. Another child comes back. With this now one adult is transported to the other end of the river. Repeat steps from 1 to 4 to transport another adult to the other end of the river. Now both the parents are on the other side of the river. Repeat steps from 1 to 4 again to transport fisherman also to the other end. Now all 3 adults has crossed the river and children are on the other side. In last step both children cross the river and handover the boat the fisherman. Fisherman now rows it back to the other side. With this full family has crossed the river. VI) In this to survive you have to see that wind is blowing from the West. So run to the West side where lighting has stuck. Take a burning wood from there and run back to the other end. Now put on fire the other end. As the wind is blowing from West, this fire will burn the small area. Now by the time other big fire reaches here this small area will cool down and hence that time you can be on this area to save your life from the fire. Here is answer to "Dead Wife Murder Crime Detective Mystery Puzzle". I have hidden this answer to avoid any spoiler. Do select the text below to read the answer. This is very obvious. Detective said come here quickly but he did not say where. so how did her husband know where the crime scene was? it means he killed her.